Thanks to its Siwertell technology from Cargotec, the Lithuanian stevedoring company Bega has not only increased its cargo handling capacity, but can now offer its customers greater flexibility and access to commercial benefits. 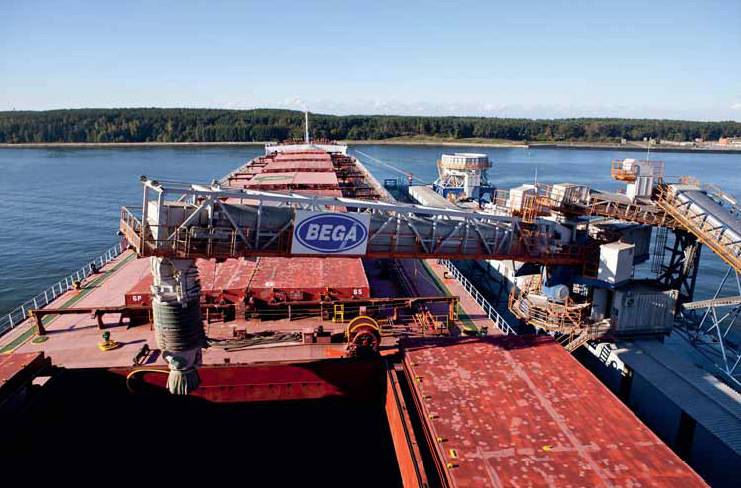 Bega, established in 1992, operates in the major Lithuanian port of Klaipéda, specializing in the handling and storage of liquid and dry bulk cargo, such as agricultural products and fertilizers. “Bega needed much greater flexibility for dealing with a range of dry agri-bulk commodities in a way that would allow importers and exporters to make the best commercial decisions with regard to their bulk assets as well as their seasonal requirements,” Ojeda says. Since the construction and commissioning of its new terminal, Bega now handles more than 4mt (million tonnes) of cargo each year, with dry fertilizers accounting for the greatest volumes; Bega’s main clients are fertilizer producers from Russia, Belarus and Lithuania. In addition to dry and liquid fertilizers and agricultural products, the company also handles oil, crushed stone, cement and other dry cargoes. Before its new terminal entered service in 2012, Bega had reached its operational limits for dry agribulk services. With no dedicated storage areas, it was impossible for Bega to store agricultural products at the port, so grain was exported through other Baltic facilities. Bega had little flexibility in the way it operated and needed a modern hub terminal to allow it to expand and offer first rate bulk handling and storage options to its customers. Ojeda says the design and equipment specification are absolutely critical when a company such as Bega decides it needs to invest in a flexible, multi modal hub terminal. “Our customers expect us to get it right first time and we do not disappoint them. They operate in competitive markets and when it comes to major investment in new projects, they need absolute certainty that the company they turn to for the design and supply of hardware will do the necessary research and planning. They want to be sure that the solution will be delivered within the specified timeframe and will work well, right from the start. Bega appreciated this uncompromising, rigorous approach; “We invited our good partner Siwertell to help us by designing and constructing our new facilities,” says Bega’s technical director, Laimonas Rimkus. Adhering to the detailed requirements of the design brief, the new terminal has significantly improved Bega’s capabilities for handling agricultural products; it can now provide the multi- modal export, import and transit flow of agricultural products that its customers need. It can also store significant amounts of bulk agricultural commodities in order to respond to favourable market conditions. As part of the infrastructure necessary to handle the massively increased cargo throughput, an additional Siwertell ship loader, capable of handling Panamax vessels at 1,200tph (tonnes per hour), was installed on a new jetty, where vessels can also be unloaded using a mobile harbour crane. “The powerful new Siwertell cargo handling equipment means we can load large vessels directly from rail wagons and from the warehouses.” This means that rail wagons are used more efficiently; loaded wagons arriving can be discharged into the storage facility and then immediately loaded with an onward agricultural cargo. The terminal’s built-in functional flexibility allows Bega to provide all the functions of a hub port; it now has the capacity to re-distribute large quantities of bulk material from vessels such as post-Panamax type bulk carriers, not only by road and rail, but also by smaller vessels covering the Eastern Baltic region. Rimkus says customers appreciate the improved service and it saves them money. Ojeda says Bega’s terminal represents a fine example of the way in which Siwertell uses its unrivalled understanding of cargo flow solutions to deliver solutions that exactly meet customers’ needs. “Cargotec offers bespoke Siwertell solutions for all types of terminals; handling virtually any dry bulk material. We carry out our design work in full consultation with our customer to make sure we provide facilities that exactly meet their requirements; we also take into consideration the potential for future expansion and alterations that might become necessary if trading patterns should subsequently change. “Terminal design incorporates engineering solutions and equipment such as ship loaders and unloaders across a wide span of capacities, storage systems, cargo weighing systems, loading and unloading stations for trucks and rail wagons, along with conveying systems employing belts and horizontal and vertical screw conveyors. The integrated systems are controlled automatically or semi-automatically, minimizing personnel requirements. “Although our products are major mechanical structures, they are frequently more compact and lightweight than the alternatives available, and this can have knock-on benefits in terms of the load bearing requirements for new jetties, for example. “It’s something of a paradox, but to fully understand the benefits of our technology, particularly when it is incorporated in a terminal complex, you have to appreciate all the things that you don’t see and hear,” adds Ojeda. They say a picture is worth a thousand words, and that is certainly true when it comes to explaining the flexibility of Bega’s new multi-modal agri-bulk hub terminal. At the heart of the Siwertell solution there are two linked warehouses with a total floor area of 20,000m2 and a storage capacity of 160,000m3. A high degree of cargo segregation has been incorporated by dividing the warehouses into eight separate compartments. The multi-modal design of the terminal means that bulk cargoes can arrive at the warehouses by road, rail or by sea. Dry agri-bulk cargo arriving at the terminal by rail wagons or trucks is directed to the covered loading and unloading station linked to the warehouses. Here, the agri-bulk material is tipped into four underground receiving hoppers. The four hoppers are served by two separate intake lines — each with a capacity of 500tph (tonnes per hour) — so two different types of cargo can be received simultaneously. The bulk material is conveyed to one of the eight compartments in the two warehouses by fully-automated overhead belt conveyors, according to a sequence set by the operator in the control room. Loaded vessels discharge their cargoes at the new jetty. Bulk material arriving in this way is transferred, via a rail-mounted travelling hopper, to an underground conveying line with a capacity of 1,000tph. The cargo can be conveyed directly to the warehouses at full conveying capacity, where it is delivered to the storage compartments by overhead belt conveyors. In all cases the automated transfer of material to the warehouse compartments is quiet and unobtrusive, with no spillage and minimal dust creation. However, there are more conveying options for incoming cargoes. Part of a cargo arriving by ship can be conveyed to one of the warehouses while the remainder is sent simultaneously to the rail wagon and truck loading station. And the same type of cargo split is also available for cargo delivered to the road/rail station. Bega has the option of transferring cargo directly from the road/rail intake to a ship. This is a very useful capability for small quantities of materials that do not require intermediate storage, and it can also be very helpful if the warehouses are full. Bega also has the capability to transfer cargo directly from a vessel being unloaded by its mobile harbour crane onward to the loader and to load another vessel. As for the cargo stored in the warehouses; an individual parcel of cargo can be conveyed to the Siwertell shiploader on the jetty, or to the road/rail loading station, or it can be split between the two. Payloaders working inside the warehouse feed the bulk material onto one of two underground conveyor systems with capacities of 1,200tph and 500tph. The larger system is used for cargo to be loaded onto ships; the smaller one is used for cargo heading for overhead buffer bins installed in the loading station for rail wagons and trucks. So outgoing cargo can be sent in both directions if required; generally speaking however, the flexibility provided by the two conveying systems means that two different cargoes can be moved at the same time. Given this level of versatility, it is important to know exactly how much cargo is arriving; how much is in storage; and how much is being conveyed for onward transport. Weighbridges are installed at all the cargo intakes. Cargo being conveyed to the ship loader on the jetty is weighed by a hopper scale installed in a separate weighing tower. Ships of up to about 80,000dwt can be loaded at a rate of 1,200tph by the rail-mounted shiploader. A system of mobile conveyors serves the shiploader, allowing loading at any position along the length of the vessel. A travelling belt conveyor transfers material from the pier conveyors to the loader.